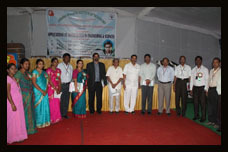 Mr.K.Karthik (15P61A0223) has received ICT Academy Youth Icon- Telangana Award organized by ICT Academy, Telangana. 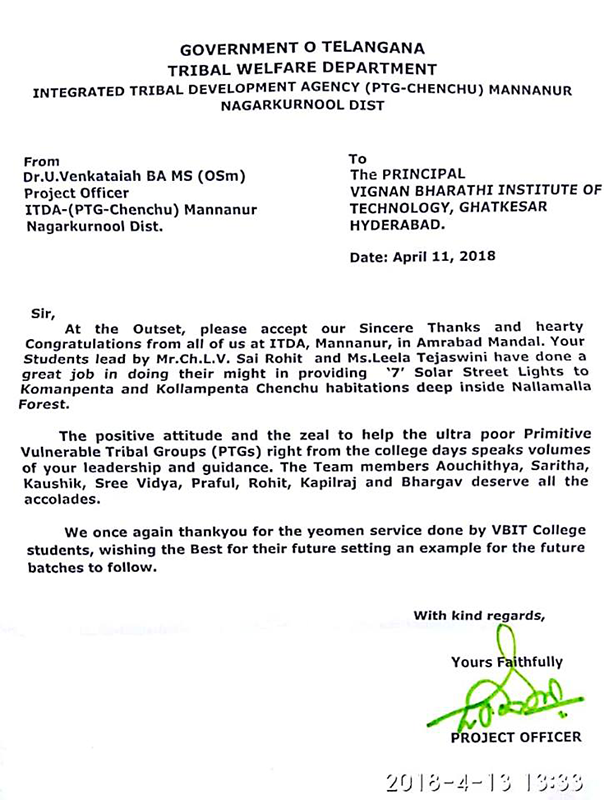 Street Cause VBIT has received Appreciation Certificate from Tribal welfare Department, Government of Telangana for installing Solar Street Lights in Komanpenta and Kollampenta Chenchu habitations inside Nalla Malla Forest, NagarKurnool District. Mr. Yashwanth Siripragada (2013-2017 batch, CSE Dept.) 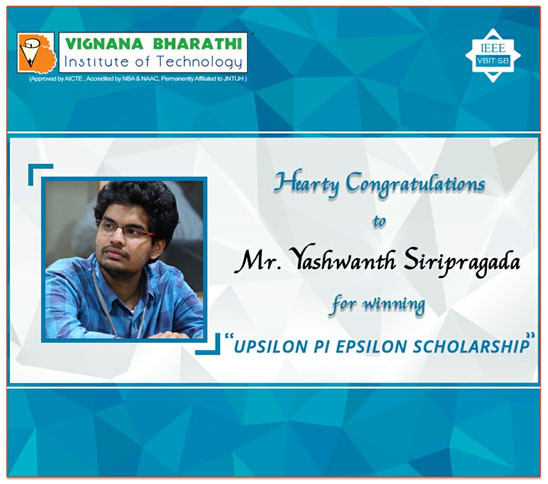 Chair person of IEEE- VBIT SB has been awarded with the prestigious Upsilon Pi Epsilon Scholarship for the year 2016 by IEEE Computer Society. Mr.K.Karthik (15P61A0223) of II EEE-A was honored as Mr.Public Speaker by Junior Chamber International (JCI) at Hyderabad. 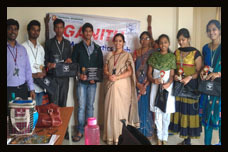 The event was organized at Harihara Kalabhavan, Secunderabad on 17-09-2016 in which 200 students were participated from various colleges of Hyderabad. 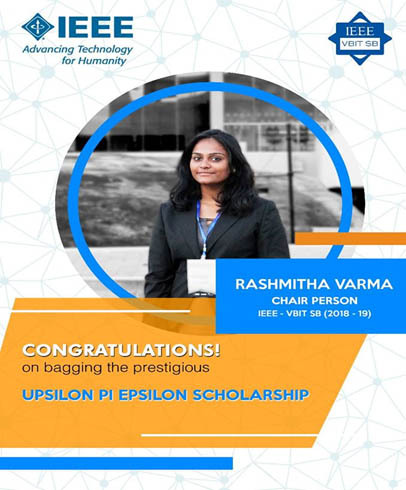 Akshita Gulati (2012-2016) student of Information Technology branch has been selected to receive the prestigious IEEE Computer Society – Richard E. Merwin Scholarship in recognition of her exemplary involvement in student chapter activities and excellent academic achievement. The scholarship includes an award and amount of $2,500. This scholarship was created in honor of the late Richard E. Merwin, past president of the IEEE Computer Society, to recognize and reward student leadership. She is the third student from this institute to receive this prestigious scholarship. A.Akhil Reddy & Krishna Shiva Raman of III ECE got selected in Final Round of Project Competition conducted by ATMEL (Micro Controller Manufacturer) at national level. 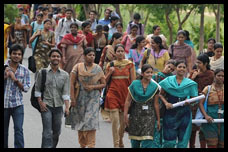 Total 164 colleges across India were participated in 1st round. Out of which 97 teams were qualified in 2nd round.Team of VBIT was among top 10 invited for final round at Coimbatore during 18th & 19th April. 2016. 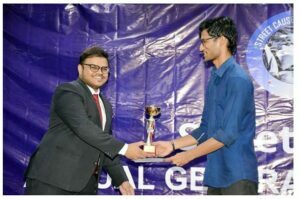 Sai Deepthi, III CSE student of VBIT has received the award at a conference held at New Delhi – “Building Cyber Security Skills” by NASSCOM – SYMANTEC. She was selected from the state of Telangana as “Woman Security Analyst”. The Award was given by Mr R Chandrashekhar, President, NASSCOM, Mr Rajendra S Pawar, Founder & Chairman, NIIT and Mr Nandkumar Sarvade, Chief Executive Officer, Data Security Council of India. The conference was a part of initiative to recognize the women power in cyber security space. 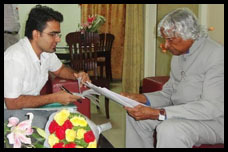 Armaan Aazad, passed out student of 2014 CSE batch has proved his mettle in upcoming technology. His startup ” LocalJao” listed among the TOP TEN start ups sponsored by “Spark 10”-India’s first European Accelerator. 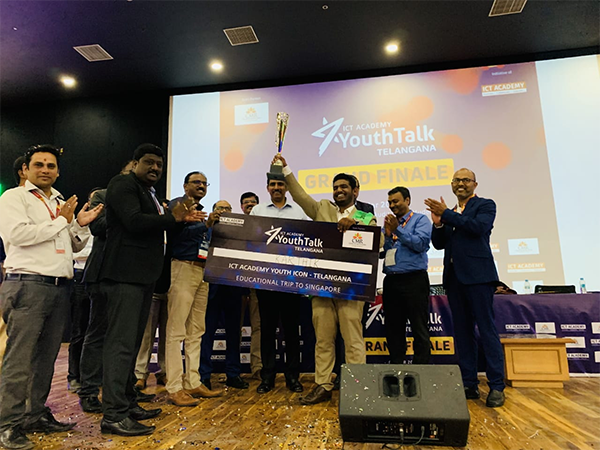 He received the award in presence of Mr. Jayesh Ranjan, (IT Secretary, Telangana State) and also had a wonderful opportunity of having a one-on-one interaction with The Godfather of European Accelerators. R.Shiva kumar, Senior Associate Consultant at Infosys & passed out student of 2010 CSE batch has authored a book “IT Speaks” which is focused on industry expectations, skill set required to be employable etc. 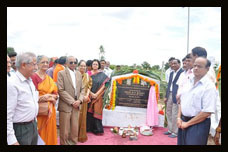 TASK (Telangana Academy for Skill and Knowledge) is a non-profit organization, a brainchild of the Government of Telangana for bringing synergy among institutions of Government, Industry & Academia with an objective of offering quality human resources and services to the industry. It provides us access to modules for enhancing our technical, personal and organizational skills at highly subsidized rates. Recently TASK organized a workshop in association with Samsung on Tizen, their own mobile operating system. The workshop was conducted in Spoorthy College of Engineering and students from almost 15 different colleges participated in this workshop. We were trained on the latest Tizen software development kit to develop applications for the operating system. 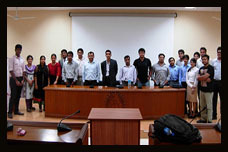 The 1st phase of the workshop was live for 6 days and was very successful in fostering the students. The 2nd phase of the workshop started on 10th December, 2015. TASK selected only 2 qualified students from each college and sent them invites to attend the 2nd phase. The 2nd phase was only a 1 day session where we were directly trained by Samsung’s official developers. The lead Software Engineer and Web Master from Samsung came forward to spend their valuable time to train us on the latest technologies which are used for developing the Tizen applications. At the end of the day, the Samsung officials conducted a competition to test our grasping and learning skills and announced prizes for the top 2 competitors. I have won the first prize in the competition and they rewarded me with a Samsung Z3 mobile. A team of four students- C.Diwakar, L.Rashmi of II CSE and R.Akshatha, S.R.Tarun of I CSE were participated in “AMITY I BELIEVE DEBATE CHALLENGE”-Season 3 organized by Amity Business School, Amity University, Lucknow campus during 15-16th October 2015. 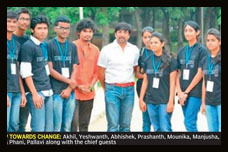 R.Akshatha & S.R.Tarun were reached to final round of the event. Mr.Arjun.J & P.B.Sirisha of II ME has won Best Innovative Project Award for their project titled “R.A.W.Car” (Road, Air, Water Car) held at 3rd International Conference and Exhibition on Mechanical & Aerospace Engineering held from 5th to 7th October 2015 at San Francisco, USA. 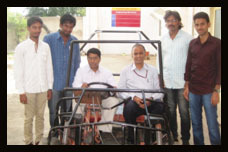 A team of Mechanical Engineering students has won special award for their innovative project-“RAW CAR” (Road, Air & Water car) at National Exhibition & Symposium on “Innovative & Futuristic Approached in Science & Technology” at Moulana Azad National Institute of Technology, Bhopal, Madyapradesh. 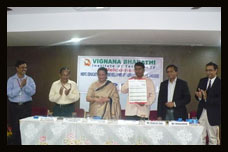 This event was cosponsored by AICTE, New Delhi. Sushmitha Capoor of III IT(2012-16) secured 8th rank in India’s Best Brains Challenge 2014 conducted by IITKharagpur. Anusha Meenakshi of IV CSE(2011-15) has won first prize in MUSE2K14-singing competition hosted by Sri Mayukha Events at Bharatiya Vidya Bhavan Auditorium, Hyd on 13-09-2014. 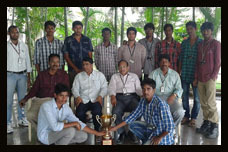 16 final round particpants from various engineering colleges of Hyderabad have participated. Vamsi J Krishna of III ECE was selected as Content Management and Interaction Design member(Student Activity Committee) of IEEE Education Society. The students (Shahid Khan III CSE,S. 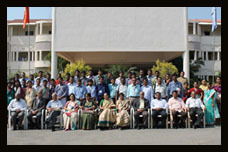 Akhila ,A.N.V. Nirmala & B. Srujan of III ECE ) of Vignana Bharathi Institute of Technology ,Hyderabad have won first prize in PADARTH, an event conducted by the Metallurgical Department of IIT Mumbai on 2nd March 2014 .VBIT was selected as zonal center for conducting preliminary rounds across India during December,2013.Twenty six teams were selected across the country from various zones to participate in the finale held at the campus of IIT Mumbai. The students have made a setup of different Eco friendly units catering to the need of rural population in India. They built a low cost water filter which recycles the waste water from the village. The water filter consist of different layer of sponge , sand, activated charcoal and a ultra filtration membrane of 10 NM pore size which does not allow bacteria to pass through it .A low cost bio gas plant designed by the students promises to reduce the construction cost by 1/5th of normal bio gas plant by giving a coating of polyurethane with 6-7 % silica filler to a thickness of 200 micron to the interior of the bio gas plant. The coating has strong thermal stability to with stand high pressure. 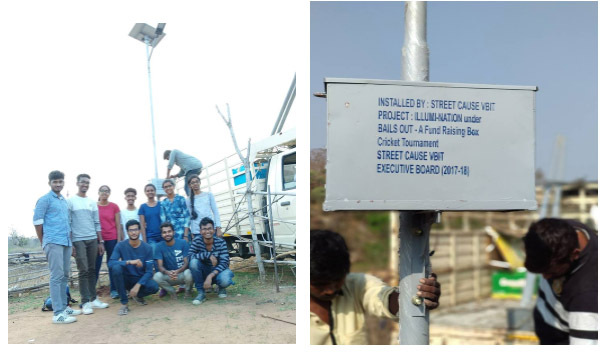 As a part of their setup, they also built a single shaft mechanism to generate electricity from speed breaker to light up the street .They also exhibited a low cost u-v insecticide to kill mosquitoes and a low cost air cooler. The students were awarded a cash prize worth Rs 15000. 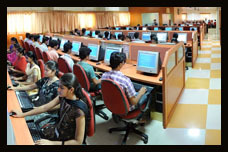 All India Council for Technical Education(AICTE) has initiated a scheme Employ ability Enhancement Training Program(EETP) to provide competency based employability enhancement skills and hands-on skill training through BSNL Training Centres/Set Ups to the students of various colleges all over India. From V.B.I.T. 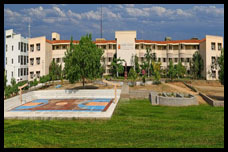 two students were selected from ECE on the basis of their academics for this program. Vamsi Krishna J Of 3rd ECE of IEEE VBIT Student Branch got selected as IEEE Day Brand Ambassador of IEEE Hyderabad Section for the year 2013. Mr.Karthik Siddawaram of CSE (2007-11 BATCH) received the Larry K. Wilson Student Activities award. This award is given to one person in Asia – Pacific region for significant and consistent contributions to Student Activities. 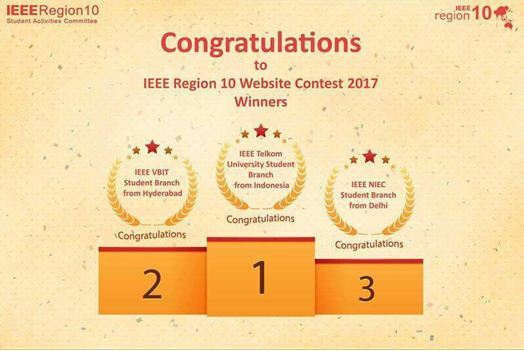 This award is given by IEEE at Region 10 Gold / Student / WIE Congress in Hyderabad. 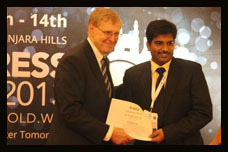 Mr.Karthik Siddawaram of CSE (2007-11 BATCH) received the Richard E.Merwin International Scholarship award from IEEE Computer Society. 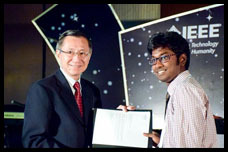 The IEEE Student Branch of Vignana Bharathi Institute of Technology has been selected for the prestigious Darral Chong Student Activity Award (Gold Prize) for 2011. Mr.Mohan Sameer from EQUINOX team comprising of Mr. Dheeraj Kokkula & Mr.Vivek Sthanam from VBIT won INDICON 2011 Vedio Contest. Sai Prasad & N. Ravi Kiran (II CSE) Won the first prize in Water Robotics Competition at Tech Fest conducted by IIT Hyderabad. Parthasarathy along with telescope he developed. He has won many prizes in State and University level . B.SWETHA SAMPATH OF ECE-IV attended 2011 IEEE Region 10 Student/GOLD/WIE Congress Auckland,New Zealand as a delegate representing IEEE-HYD SEC(7th to 10th July). Mr. Karthik Siddavaram of IV CSE(2007-11) batch has won the award for outstanding leadership by International president of IEEE for the year 2010-11. IEEE Team with Mr. MOSHEKA,Chairman,IEEE. 2010 Richard E Merwin student Scholarship Award Chaitanya Kumar Setty of IT branch(2006-10) won the Richard E Merwin Scholarship Award for demonstrating out standing involvement in an IEEE computer society student chapter,Excellence in Academic achievement and promise in future efforts. Vibrant IEEE Student branch Award(2009-10) IEEE student branch of VBIT won the prestigious vibrant student branch award for the year 2009-10.Mr. Karthik Siddhavaram,Chairperson,IEEE student branch VBIT and Dr.CRN Sharma,branch councilor receiving the award at session congress. Mr.Vamshi Krishna of ECE-branch(2004-08) won the First Prize in All India Student Project Contest Organized by IEEE Hyderabad Section. 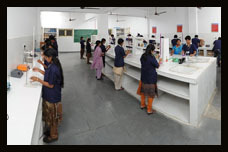 VBIT has 60 state-of-the-art laboratories on the campus. The collection in the library, housed in a spacious 2100 sq.m block include more than 23401 volumes covering different engineering streams. 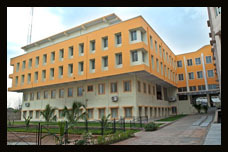 Jawaharlal Nehru Technological University (JNTU) recognized VBIT as a Research Center in the year 2011. There are two major research projects (~ 65 lakhs) sponsored by Indian Space Research Organization (ISRO) which are getting implemented in the research center. 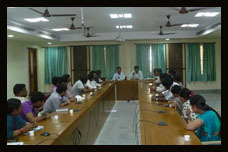 Three fulltime Junior Research Fellows (JRF) are pursuing their Ph.D. work under these projects.